It’s becoming a pattern with the San Diego Padres, split the first two games and lose the series. And it happened again Wednesdays with the Padres losing 9-4 to the Giants at AT&T Park. The Padres have not been able to string victories together to win a series since they’ve won three in a row to take the series from the Giants at home in April. They have now lost five consecutive series, four of which they split the first two games and lost the series. Richard was roughed up early in the game, giving up three runs in the first inning before Eric Hosmer’s two-run double in the third to bring the Padres to within one. Richard, however, couldn’t contain the Giants, giving up two runs in the third and two in the fourth, raising his ERA to 6.21. 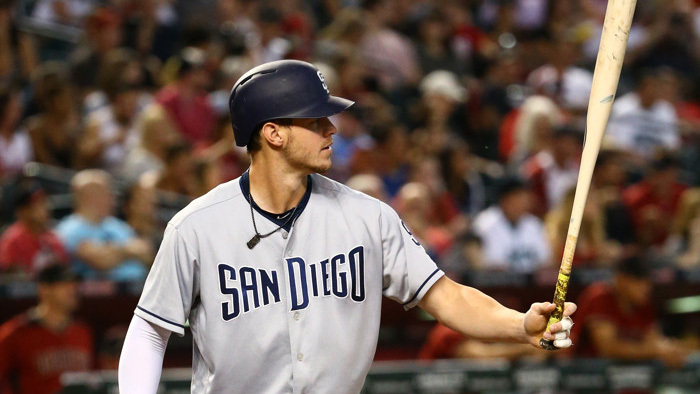 In a rare start, Padres outfielder Matt Szczur was able to contribute with a solo home run. It was the first home run of the year for the outfielder, who’s been in a bench role for the past two seasons. Before the start of the game, Christian Villanueva was named the National League Rookie of the Month for April. He recorded 15 runs, eight home runs, 19 RBIs, 25 hits and eight walks in 23 games. The honor was good timing for the Mexican-born Villanueva. He will be serving as the honorary ambassador for the MLB’s International Series this weekend when the Padres take on the Dodgers in Monterrey, Mexico starting on Friday.